On the fourth Thursday in November, by tradition, the President of the United States of America issues a proclamation calling upon all citizens subject to Federal authority to observe a day of national thanksgiving and prayer. The governors of the states concur, and likewise call upon their state’s citizens to suspend business and to take this day as a holiday. Traditionally, the custom is linked to a meal in Plymouth, Massachusetts, in 1621, but many states now argue that they had the first Day of Thanksgiving. Probably the oldest of these was in 1565 in Florida in our nation’s oldest city of St. Augustine. Still, all colonial or state precedents aside, our first national observance was requested by President George Washington, designating Thursday, November 26th, 1789 as a day of public thanksgiving and prayer to Almighty God. In his proclamation, President Washington called upon the citizens of the republic to acknowledge the providence of God through our obedience to his precepts. The President called upon Americans to beseech heaven for pardon for national transgressions and to promote the practice of true religion and virtue in our land. Presumably, the ACLU is going to have to burn those presidential decrees? Anyway, almost a century later, President Lincoln is credited with moving us towards the predictable fourth Thursday in November for this national holiday. As Catholics, a great way to start our Thanksgiving is to come as a family to the morning Mass at 9:30 here in the parish. It isn’t a Holy Day of Obligation, but there is always such a good spirit in the church from those who come to this Mass, not because we have to come, but because we want to come. Families are reunited, there is no rush, and folks are just in a happy mood. The prayers for Thanksgiving are some of the most beautiful in our Missal, and we should always keep in mind our word “Eucharist” means “Thanksgiving.” We also take up an offering for our local St. Vincent de Paul Society, reminding us that this day is linked to the idea of sharing our bounty with others. Of course, every American knows that Thanksgiving is tied into the notion of a harvest festival, so it is also about the bounteous meal at home. 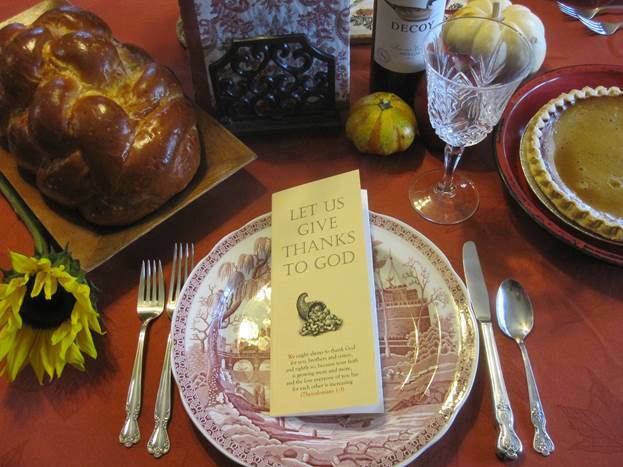 Many families have their own traditions surrounding the Thanksgiving table, but below you can find a link to a Thanksgiving brochure for those of you who may be looking to start your own thanksgiving prayer tradition.